Featuring Nike Air Max’s foray into Metallic Gold, OVERKILL’s collab with adidas and a new pair of Jordan XIII’s. This weekend’s selection of sneaker drops include high profile collaborations, colour-focused packs galore in Nike’s Air Max “Metallic Gold” pack and adidas’s NMD “Shock Pink” edition, as well as some sneakers that are just now arriving in Europe, such as the adidas and Sneakerboy “Triple White” pack. Take a look at the choices for yourself below. Nike has made a firm commitment to gold as a sneaker colorway with the “Metallic Gold” pack. The shoes available are the Air Max 95, Air Max 97, Air Max 1 and the Air Max Plus TN, all available in that striking colorway. Nike’s most forward thinking release of the week is this NikeLab ACG 07 KMTR, which introduces an ingenious fastening method that does away with laces, a process you can watch in the video above. It’s been a solid few weeks for Converse collaborations and this time it’s a clean and minimal black Chuck Taylor. There’s a Lunarlon insole for extra comfort and it looks to be slightly more widely available than other fragment design collaborations, so it’ll be worth a weekend splurge. The adidas Pureboost DPR pack has finally made an appearance after teasing the silhouette back in April. There’s two colorways available this weekend and it looks to be another adidas model that we’ll be seeing more of in the near future. The Climacool 1 is introducing a “Gum” pack that focuses on adding a gum outsole to the classic silhouette. There’s a homage to the ZX800 and the other two colorways are an all-white model and a black upper/white sole model. Nike is reintroducing the Flyknit racer on a larger scale again and have introduced some brighter colorways with the “Macaron” pack. The self-explanatory pack name complements the “Metallic Gold” pack featured above and is ideal for the warmer months. 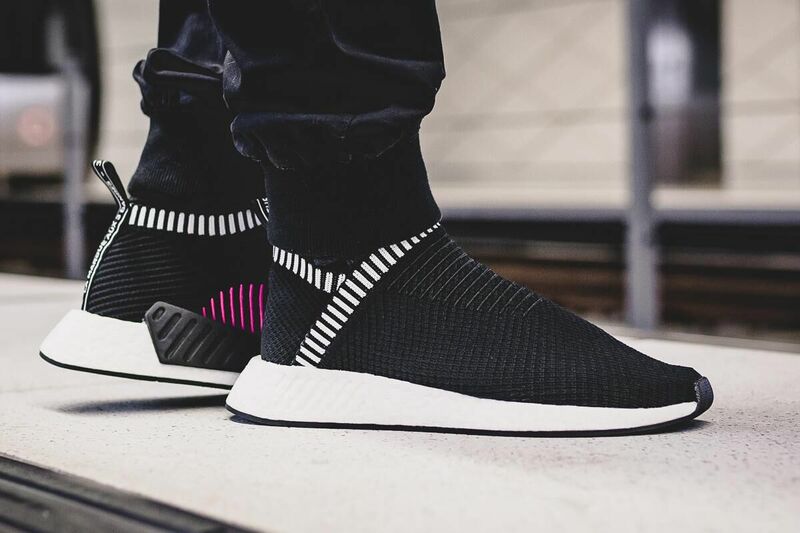 The latest pack of this week is the NMD CS2 “Shock Pink” pack, which earns its name from a pink stripe semi-circle pattern to the side of the sneaker. 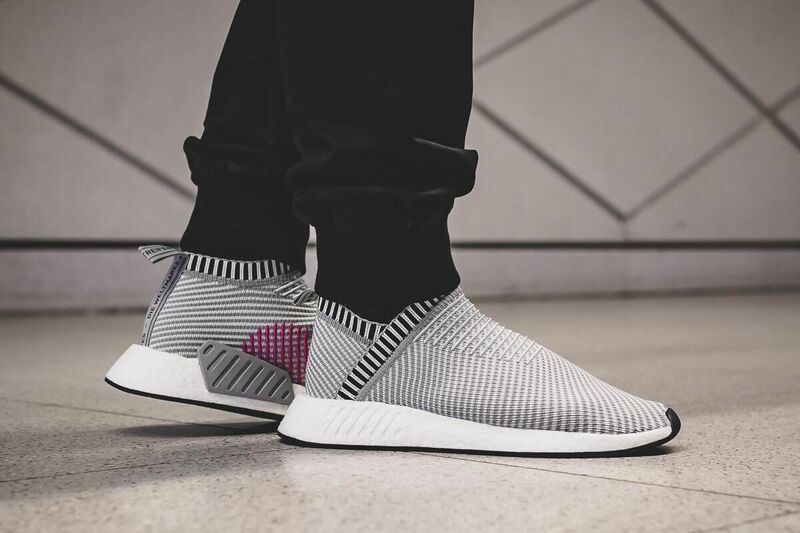 The City Sock 2 is a solid lightweight choice for those who still enjoy mid-top sneakers in spring weather. This collaboration has been available in the US for a few weeks now but it’s just being introduced to European shores this weekend. The Jellyfish-inspired “Triple White” pack consists of a pair of ClimaCool 1’s and a pair of PureBOOSTs. Inspired by Berlin’s Kreuzberg area, adidas teamed up with sneaker stalwarts OVERKILL to create the “Coat of Arms” pack. The release tomorrow is a small pre-release and a more general release follows next week. This week’s Jordan Brand release is the XIII Low in a “Pure Platinum” Colorway. It’s the latest release for a brand that’s been focusing on releasing a new retro model every week. If the XIII’s are your favourite model, now’s your time to purchase. Andy Samberg, Orlando Bloom and John Cena satirize doping in professional cycling. Eight new songs from the rising talent. The company still raked in $2 billion USD. Over 50 artists are included in this NYC-based project.